If you want to learn how to train to build broad shoulders as quickly as possible… Then you need to read this article. To find out what men strive for, just find out what women like! Multiple studies (1 , 2 , and 3 ) have shown that women rate broad shoulders as one of the most attractive features in the male physique. Not surprising then that wider, broader looking shoulders are one of the most sought-after bodily features that men aim to achieve. And beyond this biological reasoning, wider shoulders have multiple appearance enhancing benefits. ….but big shoulders create the illusion of a smaller waist as well. So how exactly do you build wider shoulders? Well, although genetics will play some role in how wide your shoulders appear, you can definitely add further width to them by targeting a specific portion of the shoulder; the lateral deltoids. Given that the lateral deltoids comprise the middle portion of your shoulders, adding more size to them will create the effect of wider looking shoulders. However, despite the importance of this muscle and despite performing the right shoulder workouts, most people just don’t train them as effectively as they could be and instead make several training mistakes that in turn limits the development of this muscle. This article will point out exactly what those training mistakes are and more importantly, how you can fix them so that you can get broader, wider shoulders as quickly as possible. Most people’s go-to exercise to target the lateral deltoids are dumbbell lateral raises. 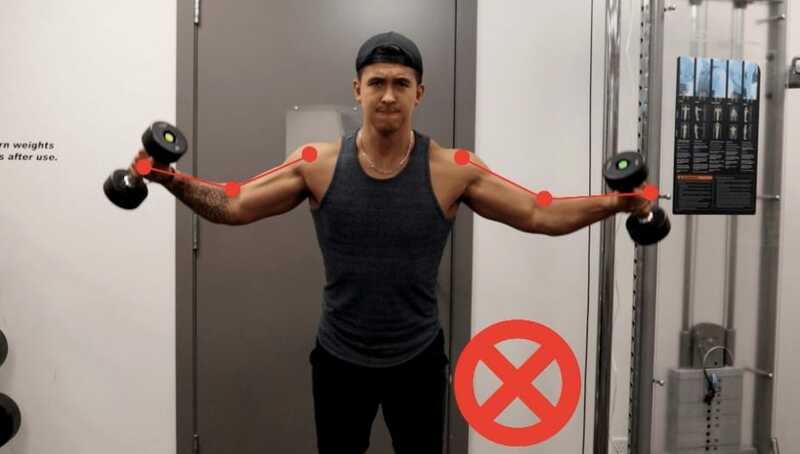 This is a good option since they’ve been consistently shown by studies such as this one to elicit the highest lateral deltoid activity when compared to other common shoulder exercises. However, while lateral dumbbell raises provide superior EMG activation of the targeted muscle, they do have a key disadvantage. This can be seen when analyzing the resistance curve of the movement. In contrast, at the bottom half of the movement, there’s very little tension placed on the shoulders. That means that sticking to dumbbells exclusively is not the best way to maximize the development of this muscle. Cable lateral raises can help solve this issue by providing more consistent tension on the side deltoids. The reason for this, is that the resistance is applied out to the side, rather than straight up and down. And if you don’t have access to cables, use resistance bands which can also help provide tension laterally. Bonus Tip – Lean Away! 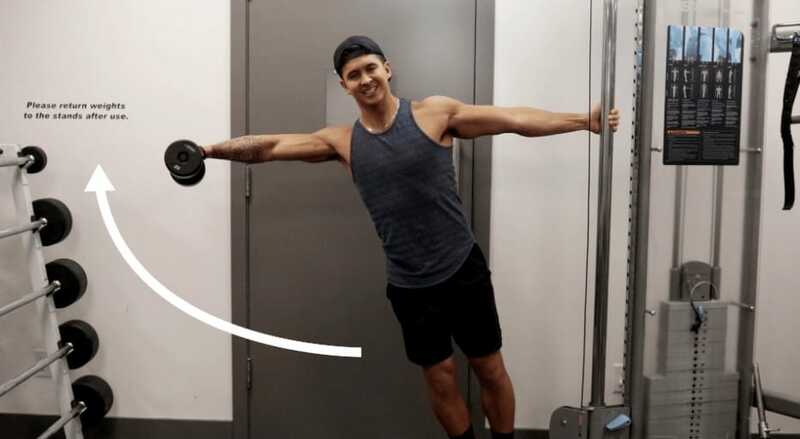 To make the cable and dumbbell versions even more effective, you can slightly lean in the direction of the raise by hanging onto a pole with one hand as you perform the movement with the other arm. These are just extra lateral raise variations for you to experiment with and implement accordingly. 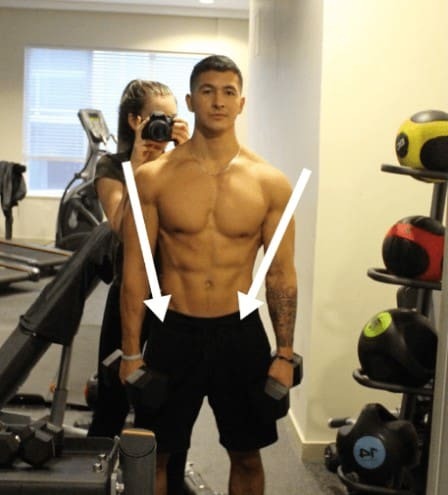 So, as a summary of this point, to get the most out of these exercises and ensure optimal development of the side deltoids, you will want to perform both dumbbell and cable lateral raises. 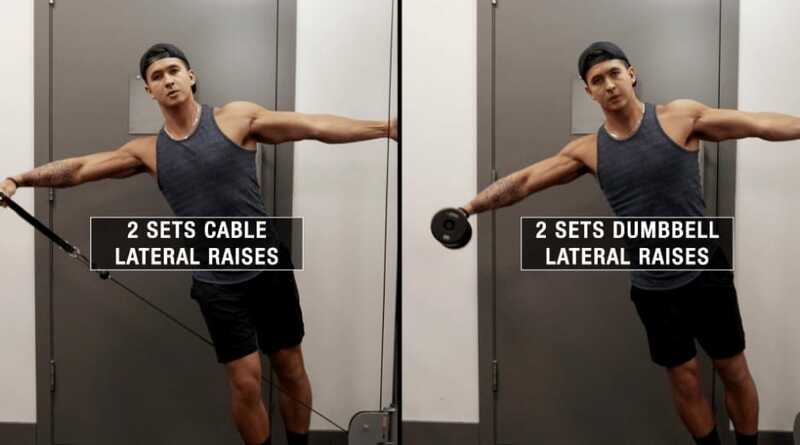 A good option for example if you perform 4 sets of lateral raises in your workout is to dedicate 2 to dumbbell lateral raises and 2 to cable lateral raises. This will allow you to reap the benefits that each exercise has to offer. Doing this somewhat defeats the purpose of the exercise. Because it shifts some of the tension away from the shoulders and towards the rotator cuff muscles instead. 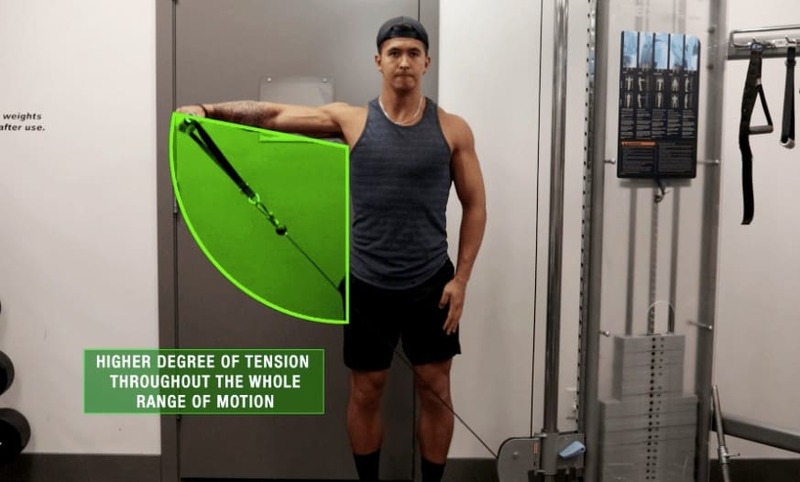 This is because performing the movement in this fashion now involves more external rotation than abduction – the main role of the lateral deltoids. Often times, performing the exercise incorrectly in this way also shortens the range of motion. …so what should you do to fix this? And as you perform each repetition, you should be thinking about leading with your elbows rather than raising the weight with your hands. Performing the lateral raise while consciously driving the elbows upwards will increase the range of motion through which you can strengthen your deltoids and helps maximize shoulder abduction. If you’re still struggling with this however, then I’d highly recommend incorporating kettle bell lateral raises. Performing lateral raises with kettle bells can better allow you to consciously lead with the elbows. This is due to the way gravity acts on the kettle bells as you raise. Also, using kettle bells can be a good way to add a little bit of variety. So feel free to experiment and swap between dumbbells, cables, and kettle bells for your lateral raises. Another common mistake is allowing your traps to take over the exercises you are doing to strengthen your deltoid muscle. Having broad shoulders and strong lateral deltoids is dependent on ensuring that you avoid letting your traps takeover the exercises you do. Bad posture and inadvertent shrugging in day-to-day activities causes over-activation of the trapezius muscle group which tightens as a result. This over-activity means that the upper traps take over many shoulder exercises such as the overhead press or the lateral raise. 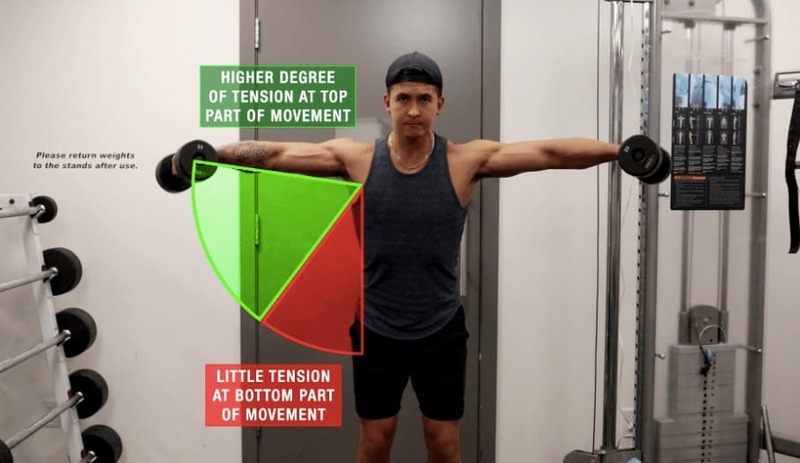 This is problematic because in order to optimally activate the middle deltoid during the lateral raise, the shoulder girdle and upper traps should stay depressed. You want to avoid excessive shoulder girdle elevation. Less Traps = Bigger Shoulders! The upper traps will tend to want to be involved in the exercise, especially as you raise your arm up. To combat this, simply focus as you perform each rep on keeping the shoulder girdle depressed and the upper traps relaxed. Another helpful tip is to use a “thumbless grip” when you perform your dumbbell and/or cable lateral raises. 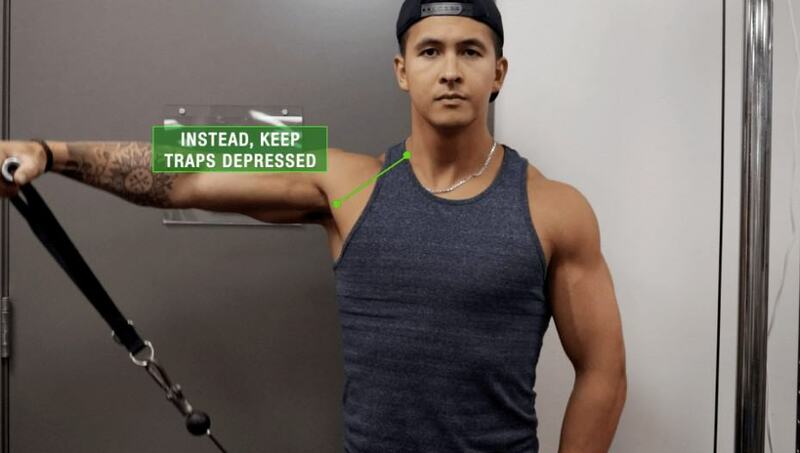 This seems to help better activate the shoulders and minimize upper trap involvement. Once you have mastered this, you can then slowly add weight to practice and then eventually apply this to your working lateral raise sets. These recommendations are essential to maximally activate your lateral deltoid muscle and to give the appearance of wider shoulders. And as you learned in this article, if you want to see the best results then it’s vital that you not only choose the right exercises and variations. Even more importantly is that you implement and perform them correctly within your routine. …you’re able to build muscle (and lose fat) as fast as humanly possible. A proven, evidence-based, detailed approach is what’s going to enable you to progress at the fastest rate and is how thousands of members are transforming their bodies faster than they ever have with the #BuiltWithScience programs. Within my programs you’ll have access to weekly workouts, a powerful nutrition software, exercise video tutorials, meal plans, a private Facebook group, and so much more. Anyways, as always, thank-you for the continuous support! I always enjoy implementing your suggestions and reading the questions you have posted in the comments section!! Please follow me on Instagram and Facebook, and subscribe to my Youtube channel where I will continue to frequently post videos on various fitness topics!